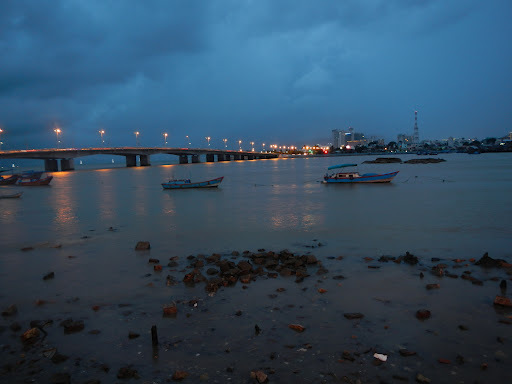 Currently, I am occupying space in the city of Nha Trang, Vietnam, in the apartment of my friend Max. His apartment is a couple blocks from the beach, which looks exactly like how it did in the pictures. The sand is grainy, like coarsely ground salt, and the water is turquoise blue, except when the river stains it brown with sediment from the mountains, as it did yesterday after a heavy rain. There are islands out in the ocean which rise up directly from the water, like steep-backed turtles, giant rock chunks with no sloping beaches. It looks surreal, and, as I did when I visited the Galapagos Islands, I feel like I’m in a dream where I fell into a National Geographic spread and it’s all going to disappear any second when I wake up. 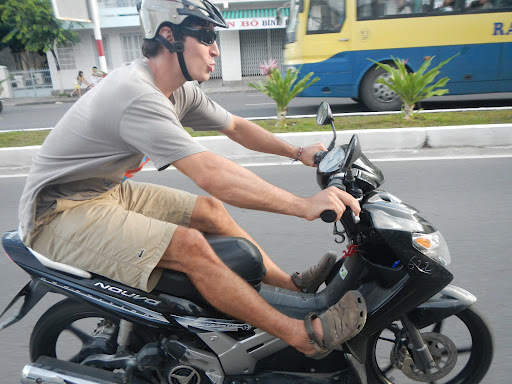 The best way to get around Nha Trang (in my opinion) is by motorbike. There are easily four times as many motorbikes as cars on the road, everyone seems to have one. By law only two adults can ride on a motorbike at one time, but seeing entire families, two parents, two or three children, crammed on one bike is common. I’ve seen a man on his motorbike balancing 6 boxes on the seat behind him, the bottom one a flat screen TV, some in the middle other electronics, and on top a 24 pack of beer cans. Nothing was strapped on, he casually rested one hand on the top of the stack to steady it. Another man rode along with chickens, probably destined for one of the many food stalls that line the roads, strapped to every possible surface, so that from a distance it looked like his bike was covered with a giant feathery skirt, floppy chicken heads dangling like pom-poms. Max has a rental bike, which we use every day to explore the city. He picked me up from the airport on his motorbike, which was an experience. I had just spent the past 2 days traveling, which totaled four flights, the shortest being 1 hour, the longest 12 hours and 40 minutes. It was dark and rainy when I arrived, and I had to empty most of the contents of my backpack to find my raincoat before we left the airport. It was wet outside, and he had parked in a puddle, which I realized after I stepped in it and soaked one sock. He handed me a helmet, showed me where to put my feet and where I could hold on, and away we went. I’d never ridden a motorbike before, and this certainly was a memorable first time. It started raining once we left the airport, but stopped after maybe 10 or 15 minutes. Luckily, I had only one backpack, so I could hold on with both hands to the bar behind me. The ride to his apartment was about 45 minutes, but the roads here are generally in good condition so we made good time. It was beautiful, watching the lightning periodically illuminate the ocean on our right and the mountains in the distance, though I didn’t realize I had a death grip until we stopped to eat some noodles close to his apartment. Now, after a few days, I can jump on back and, after strapping on my pink helmet with a cartoon dog on the side (Max picked it out, I had no choice in the matter) take pictures with one hand while pointing out some interesting sight with the other. Max is an excellent driver, and I’ve yet to witness any accidents. The city feels safe, and I don’t worry that I’m going to get mugged or kidnapped or even run over by a bus, though my friend Pooja and I did almost get run over by a front-end loader the other day while walking down the street. The streets are generally pretty clean, even though everyone throws their trash into the gutter. Max told me that the government pays the poorer people to clean up the trash every night, which gives them a job and keeps the streets semi-litter free. The buildings are chaotic-looking, and I get the impression you could easily find anything you could ever need in the open-air one room stores that line the streets. We eat most meals at street vendors, sitting at kindergarten-sized tables on stools that bring my knees just about level with my chin. Most of these places are where the locals eat, and serve only one dish. Most of the time we walk up, Max says something in Vietnamese to the woman sitting behind the table, and in a few minutes a freshly made plate of something delicious is set in front of us. Most dishes contain either noodles or rice, some kind of meat, and all sorts of amazing flavors I can’t start to describe. Usually spicy, always mouth-watering. The only thing I’ve had here and wasn’t a fan of was the avocado and coconut shake, which had too much avocado and not enough coconut for my liking. The color was a little off-putting too, a light yellowish green that reminded me of slightly off pea soup. One of my favorite things to do is have Vietnamese coffee in a small glass, strong and dark, mixed with condensed milk and sugar, ice added. Coffee here takes hours, though the glass is only about the size of my fist. This is a savoring experience, both of the coffee and the company you are with, be it new Vietnamese friends, communicating with broken English about our lives in different countries, or old friends, sharing memories and dreams. I will miss this when I go back home again, where coffee seems to usually be a rushed affair, at most half an hour, surrounded by people who are in a hurry to get somewhere they think is important. No one here seems to be in a hurry, though I don’t think that anyone is usually late. Even the traffic seems calm, no road rage, no screaming, cursing drivers when the tall, white foreigners wander blindly into traffic and everyone swerves around. Even in the city, there is an underlying sense of calm, a deep peace like the ocean that sits next to everything. 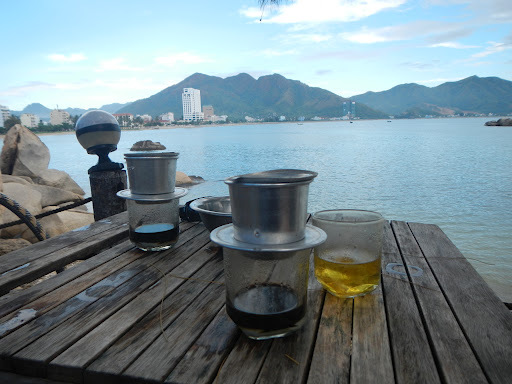 Vietnamese coffee and an excellent view. I think Pooja, another friend from OWU who is out here to travel with me for a few weeks, will be leaving for parts unexplored soon, heading north to Hue, Hanoi, Halong Bay. We plan on taking buses and trains, another new mode of transportation for me. I’ve ridden on both before, but never for more than an hour or so. Most trips here take a good 10 or 11 hours, so luckily the seats are comfortable and the views entertaining. Everyday is a new adventure, and I look forward to experiencing what the world next offers. 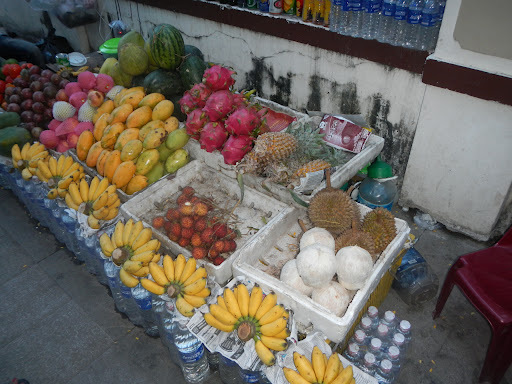 If you're still in Nha Trang, have a look at my blog at minhinnhatrang.blogspot.com for some excellent dining places.I'll get back to Nha Trang on November 21 myself.